I was born on 4 th November 1966 in Sumbawanga, the southwest of Tanzania. In 1977 I started primary school, I was 10 and I was very interested to be artist. I was spending time doing sketches in sand. Once I started the school, I felt lucky to be there because there I found papers, pencils and colour chalks. Nine years old, I had begun to draw on paper. Later I started to make drawings on black board. But how much then I disturbed my teacher!!!! 1983: I finished Primary school. I spent time in my village helping my parents farming, fishing and hunting. 1987: My brother advised me to move from my village to Dar es Salaam city so that I could be able to improve in art. 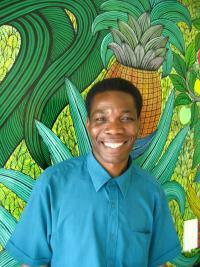 1990: I joined and learned Tingatinga art style from Peter Martin at Village museum in Dar es Salaam. 1996: I started to be illustrator of children’s books. 2000: I published my first book in Switzerland in German language.